Hey everyone! So today on Instagram I posted the picture of my pie slice I brought to Thanksgiving dinner. It was a Chocolate and Dulce de Leche Cheesecake Pie. Since I wasn’t planning on posting the recipe, I mentioned that if anyone wanted it, they could just dm me and I would offer them the recipe. So, I experienced a downpour of messages asking for this recipe!! And I gotta tell you, I love you guys. This is what keeps me going!! 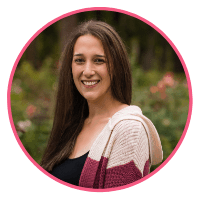 Since so many people were asking for the recipe, I felt like it would be fair to write a blog post. And I also would like to THANK YOU all for the support and the LOVE you show me everyday!!! I wish I could give you all some pie! Since I wasn’t planning on posting the recipe, I don’t have a whole lot of pictures today. 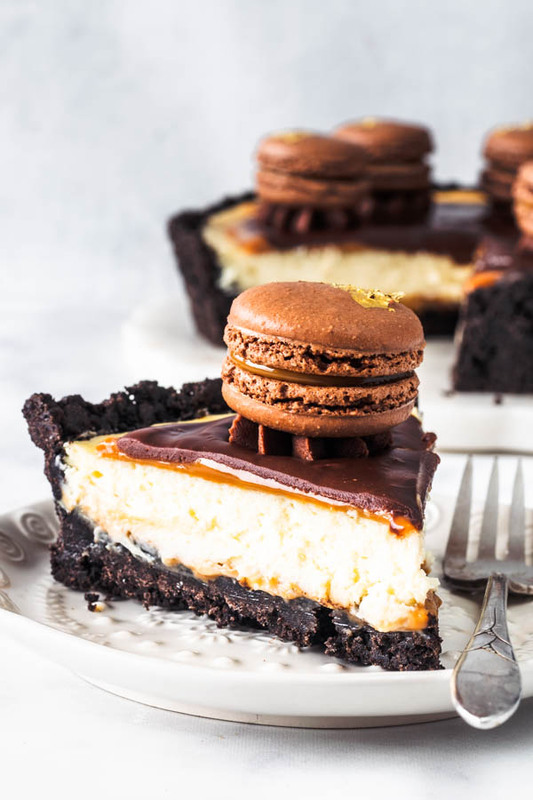 But I will tell you a bit about this Dulce de Leche Cheesecake pie. We start with an Oreo Crust. 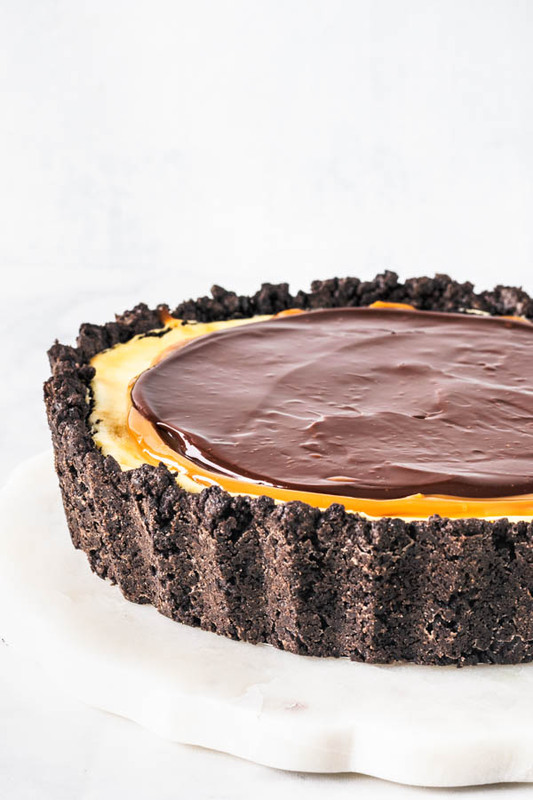 Don’t par-bake the Oreo crust, simply press it onto the bottom of a tart or pie plate, and insert it in the freezer to firm up well while you make the cheesecake filling. 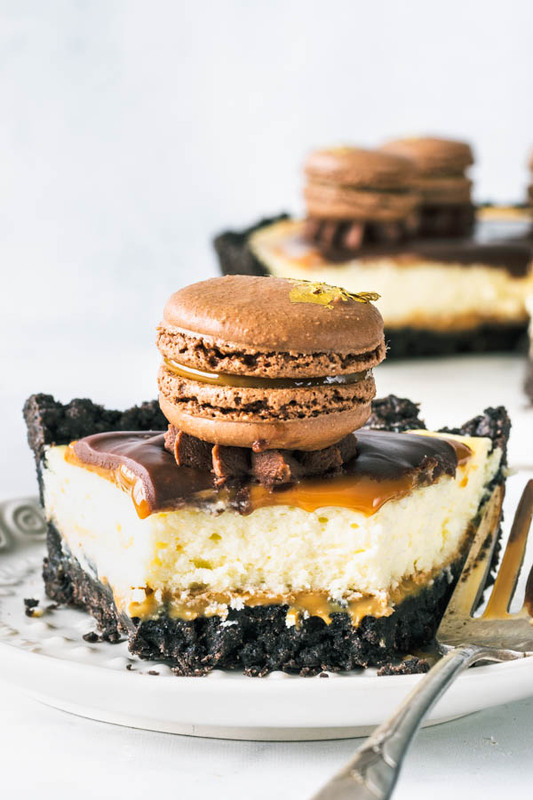 Spread some dulce de leche over the chilled crust, and then pour the cheesecake batter over the dulce de leche. Once done baking, you are going to wait for your Dulce de Leche Cheesecake Pie to cool down, and chill in the fridge for a few hours. 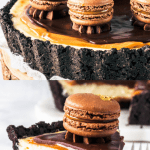 Then, you may spread some dulce de leche on top of the pie. And complete with the beautiful and delicious ganache. I ended up saving about 1/2 cup of the ganache and placed it in the fridge for a few minutes. When I took it out of the fridge, I used a whisk to smooth it out, and placed the ganache in a piping bag. 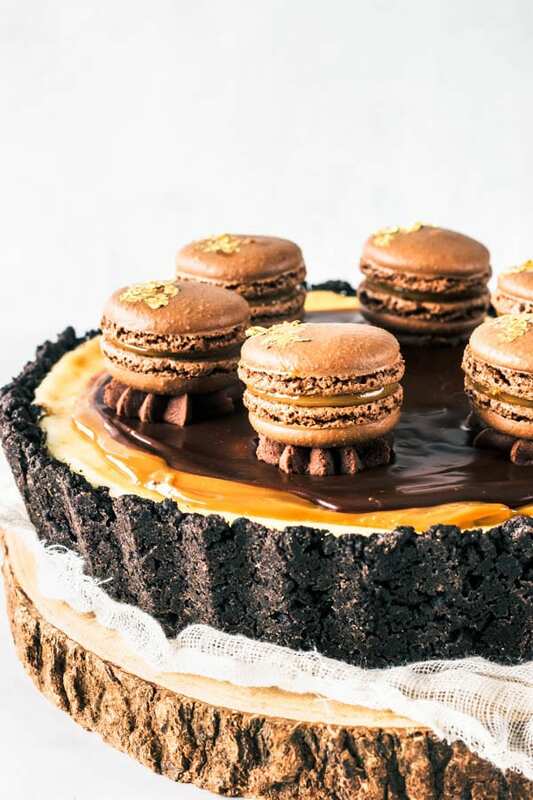 I piped ganache on top of the pie and placed my Dulce d Leche Macarons on top. I ended up making two different designs for this pie, because one was brought to Thanksgiving and the other one was brought to my job. So you may notice the two pies are slightly different. 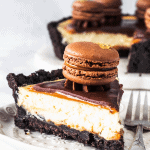 Hope you like my recipe and my rich delicious Chocolate and Dulce de Leche Cheesecake Pie! Thank you!! Click here to check out some more pies. And some of my favorite holiday dessert recipes are: Almond Cherry Bars, Pecan Fig Cake, Pumpkin Creme Brûlée, Pistachio Cranberry Babka, and Cashew Caramel Babka. 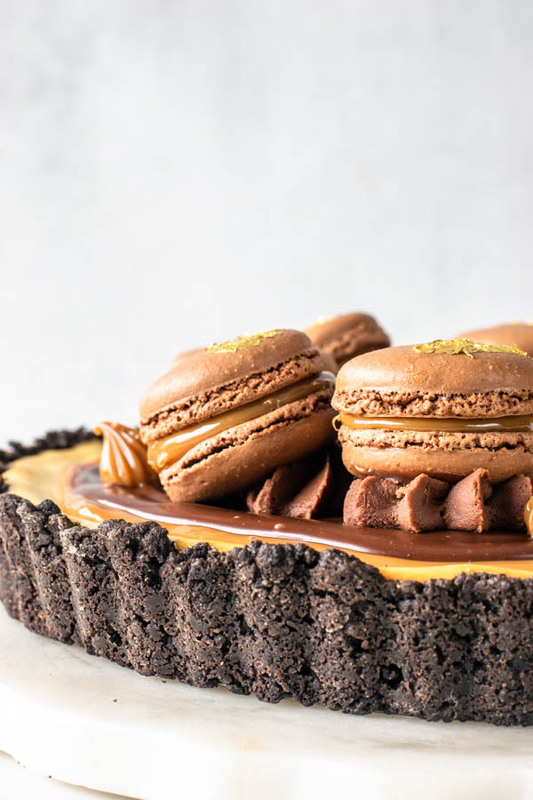 This Chocolate and Dulce de Leche Cheesecake Pie features an Oreo crust, a creamy and rich filling, topped with dulce de leche and chocolate ganache. You can process the oreos in the food processor along with the filling, don’t worry about scraping the filling off. Mix with the melted butter. Press onto the bottom and sides of a tart or pie pan. 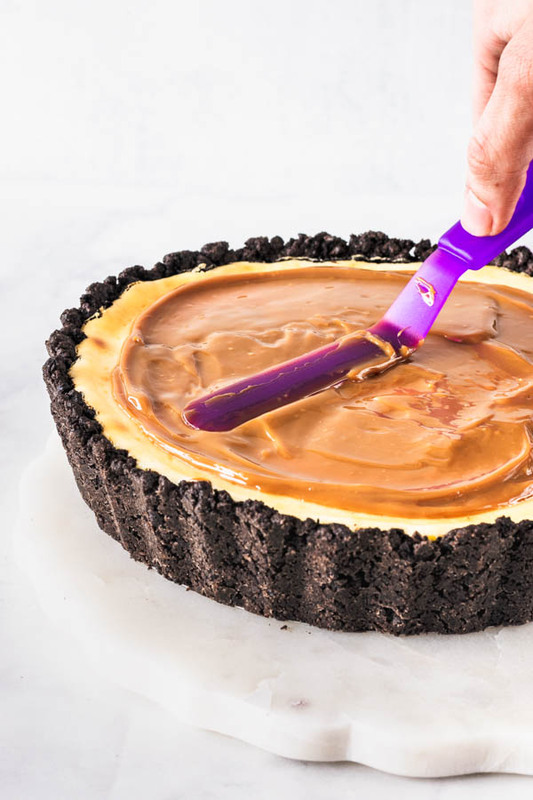 You can do a cheesecake pan and just press the crust onto the bottom too if that’s what you want, and bake it as a cheesecake. I used a 9-inch tart pan with a removable bottom. Place pan in the freezer while you make the cheesecake batter. In a mixer, start beating cream cheese until fluffy, for about 1 minute. Add sugar, beat for another minute until incorporated. Add sour cream and mix until incorporated. Add egg and mix. Scrape sides of the bowl whenever necessary. Add vanilla. Then add flour and mix to combine. Spread 2/3 cup of the dulce de leche on the bottom of the pie, right on top of the chilled crust. Pour cheesecake batter on top. Bake in pre-heated oven for about 20-30 minutes, until cheesecake sets, and jiggles slightly when you shake the pan gently. Remove and let cool. Then chill in the fridge for a couple hours. Place chocolate chips, or finely chopped chocolate in a bowl. Heat cream over medium heat until starts to bubble. Pour over chocolate. Let it stand for a minute. Stir with a spatula until all chocolate has melted. If chocolate doesn’t melt, and you still see lumps in your ganache, you might want to insert your bowl in the microwave for a few seconds at a time and stir in between until there are no more lumps and your ganache is smooth. Once pie is chilled, you can spread the remaining 1/3 cup of dulce de leche on top of the pie. Then pour cooled ganache on top, use an offset spatula to spread it if necessary. 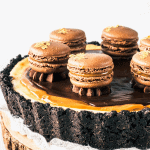 And then placed my Dulce de Leche Macarons on top of the pie. Pie will keep for up to 4 days in the fridge, covered well. Essa vou tentar pro natal, sensacional!!!!!! !